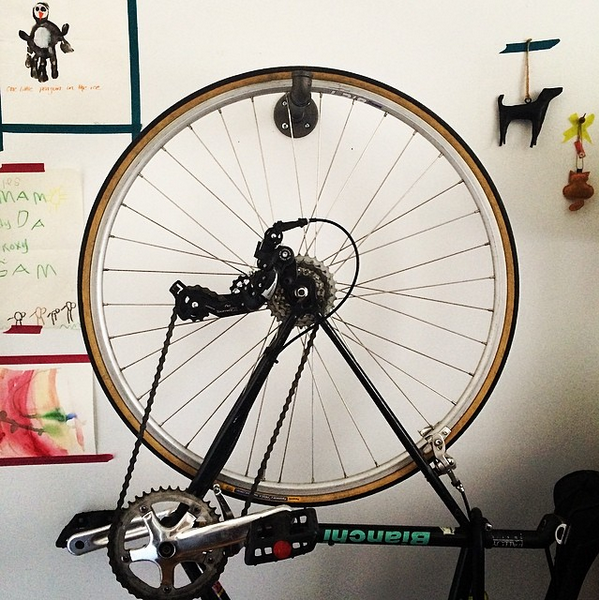 How to park your bike on the wall with just a few parts from the hardware store. When you're looking for an apartment in New York City, it's written into the process that the list of amenities you think you require as a reasonable adult seeking shelter—natural light in every room, working appliances, a closet in your bedroom—will be crumpled up and tossed, better forgotten than clung to, when you finally spring for a place. It turns out that if you love the city enough (and you must), you can get used to anything. My current apartment, which I share with my roommate Justine, is actually pretty great, with really tall ceilings and a brand new fridge. Sure, the ceiling in my room sometimes leaks water from the bathroom above us directly onto my bed and there have been a couple of times when the local homeless took shelter in our hallways, but we love it. When I decided to move in, we found a way to make room for all the junk I drag around with me (yes, I'm due for a KonMari cleanse) like books, kitchen supplies, and clothes—but one of my posessions just did not fit and yet could not be shed: my bike. When every inch of space is accounted for, where in the world do you put a bike? It leaned up against some shelves in our hallway for a while, until I finally went to the local bike shop to see if they had storage tips. A hook that could be mounted in the ceiling seemed genius, but as mentioned ours are pretty far up and just the thought of a ladder that tall gave me the willies. 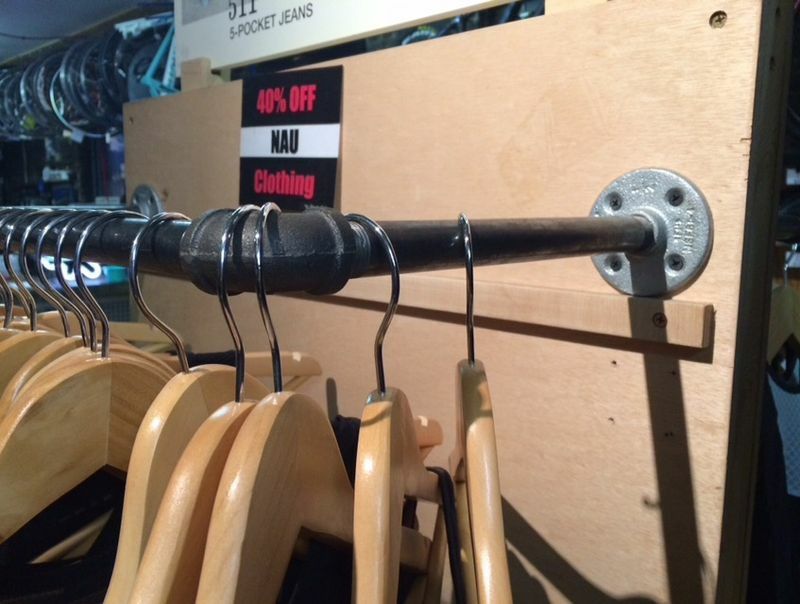 There are also plenty of fancy modern bike wall racks out there, but they're kind of pricey. What I ended up going for was a tip gleaned from the shop's clothing racks: a gas pipe. Sold in standard 8-inch lengths, a piece of gas pipe can be screwed into a wall bracket like the round one above, attached to the wall with a few toggle bolts, and wrapped in electrical tape for just a few bucks. For the toggle bolts, which actually punch through the wall and grip it from the inside like a clamp (that helps them bear weight), you'll have to drill a few sizable holes with a bit. The electrical tape wrapped around the pipe prevents scratches to your bike. With guidance from the fellas at my local Ace Hardware and a bit of precision with a power drill, the rig came together in minutes. If you care about style, it's got that industrial-cool look and is relatively minimal—though you could spray paint it white if you wanted it to blend in with your walls even more seamlessly. Hang it approximately at eye level, so it's easy to pick up your bike and hang it by the back wheel (the pipe goes right between spokes). If you're anything like me, you'll enjoy it as a bit of wall art, too. An earlier version of this article suggested using molly bolts, but what you'll actually want are toggle bolts—which are much stronger; the instructions above have been updated to clarify. What are your best tips for creating storage in a tiny room? The liner is coordinated to particular concoction prerequisites to improve life span including the capacity to withstand high-temperature necessities or scraped spot resistance. Great idea, always looking for a new way to store my bike. Could you post a full length picture of the bike hanging? SUCH a good idea, Amanda! How would you drill a Molly Bolt into a plastic anchor? Not that it matters; something like a bicycle- fairly heavy, often moved- needs to be attached to the framing, and hooks are sold for the purpose. Sheetrock is too fragile and plaster and lath too fragile and prone to cracking for t5his sort of use. The molly bolts go right into a large hole you drill with a bit—not into anchors—thanks for pointing that out! Adjusted the copy to clarify.